One of the most common animal removal requests we receive here in Dallas, is for mice. They are attracted to the food, warmth, and shelter that a home provides while they nest and reproduce. Once inside your home, they will begin to multiply quickly, which means that just a small handful of mice can turn into a massive infestation if not addressed properly. We always recommend leaving the removal of a mouse infestation to the experts here at Critter Control® of Dallas, but using DIY traps can be an effective way to keep a small mouse problem at bay. If you notice mouse activity before it grows into an infestation, these tips may help your DIY trapping efforts succeed. 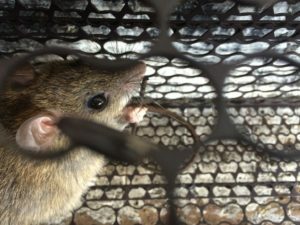 Be careful with your scent – Just like many other animals, mice have a very sensitive sense of smell, and will avoid traps that have your scent attached to them. Thoroughly wash your hands before handling any traps you intend to set. Use care when placing the traps – A key to effective trap use is placing them in areas of high traffic. Keep an eye out for signs of activity such as bite marks or shreds of paper marking their path. Use the right bait – Foods that are high in protein are especially attractive to mice. Peanut butter is a popular option as it can’t be removed from the trap without setting it off. Use more traps than you think you need – Even if you only have a few mice on your property, put down more traps than you think you need. They are skilled at avoiding danger, so the more traps you have out, the better your chances of success. If you do find success with your mouse traps, it is critical that you do not handle any mouse carcass without professional assistance. Dead mice carry huge numbers of diseases that can be life-threatening to you and your family. For any of your mouse removal needs, contact Critter Control® of Dallas today at 817-222-1101.